(177 x 263 mm) 8.3 x 11.7 in. (177 x 263 mm) 11 x 14 in. SMALL 10 x 14.7 in. (255 x 373 mm) 12 x 17.25 in. A3+ Size 12 x 17.9 in. (304 x 443 mm) 13 x 19 in. This thangka depicts the blue Primordial or Adi-Buddha, Samantabhadra, as a single deity composition. Samantabhadra (Tib. Kuntuzangpo), meaning the 'all-good' or 'ever perfect', is the supreme or principal Buddha of the Nyingma or 'ancient-school' of Tibetan Buddhism, and the source from which most of the Mahayoga, Anuyoga and Atiyoga classes of the highest tantric transmissions originate. As such he symbolizes the dharmakaya, the supreme buddha-body of absolute reality, which represents the innate or natural purity of consciousness. As the Adi-Buddha he is also the source from which the hundred peaceful and wrathful deities (zhi-khro) of the Zhitro or bardo-mandala originate. He is also known as the 'Father of all Buddhas' in the Mahayoga texts of the Guhyagarbha Tantra, and in the Seventeen Tantras of the Dzogchen or 'Great Perfection' cycle of transmissions. 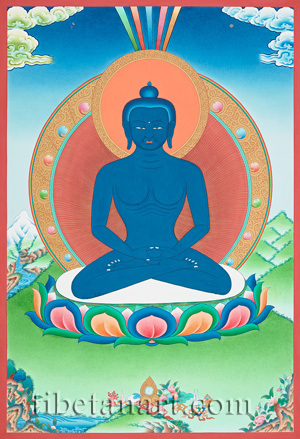 Samantabhadra is deep blue in colour, naked and unadorned, which symbolizes the space-like and indestructible nature of the dharmakaya as the natural purity of consciousness, or the innate awareness of buddha-mind. He sits in vajra-posture upon a white moon disc and a multicoloured lotus, with his two joined hands resting upon his lap in the dhyana-mudra of meditation upon emptiness. He is endowed with the thirty-two major and eighty minor marks of an enlightened Buddha, and fine rays of golden light emanate from his body against the red expanse of his inner aura. His outer aura is composed of golden scrolling segments with enclosed jewels and a narrow ring of rainbow light, with shafts of rainbow light ascending above his halo. In the lower landscape are the five sensory offerings, and the seven emblems of a chakravartin or universal-monarch. Samantabhadra also frequently appears in union with his white consort Samantabhadri (Tib. Kuntuzangmo), who manifests as the 'Mother of all Buddhas' and is likewise completely naked and unadorned. She sits upon his lap in sexual union with her two arms embracing his neck, her head inclined to the left as she kisses his lips, and her hair flowing freely down her back. Samantabhadra, as the male deity, represents the luminous or apparitional nature of the dharmakaya. And Samantabhadri, as the female deity, represents the pure emptiness or non-apparitional nature of the dharmakaya. Their union symbolizes the coalescence of pure appearance and emptiness.